We drove to Wales on a Thursday afternoon, arriving late. Friday dawned with rain and clouds and gloom, which continued throughout the day. Leah had plotted out an itinerary of sites from the book, but we had trouble from the beginning. 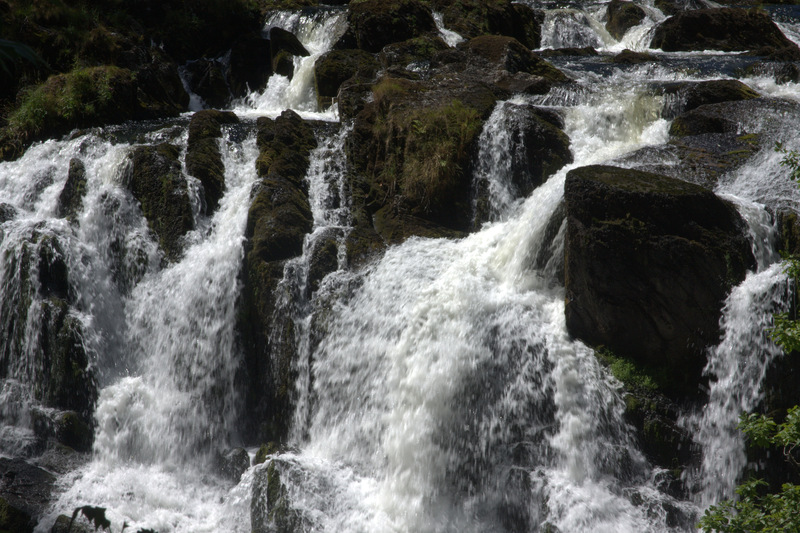 Some sites were impossible to find (the Pass of the Two Stones) others disappointing (it was too wet and late in the day to hike up to Aber Falls). By four in the afternoon, we were totally dispirited. As Leah said “All we’ve had today is the castle we couldn’t find, the Pass we couldn’t find, the church that wasn’t the church, the church that was the church but was closed, the sea view with no view and the hill that might have been the site of a castle.” We decided to try one last site before heading back to the hotel – Dolbadarn Castle. 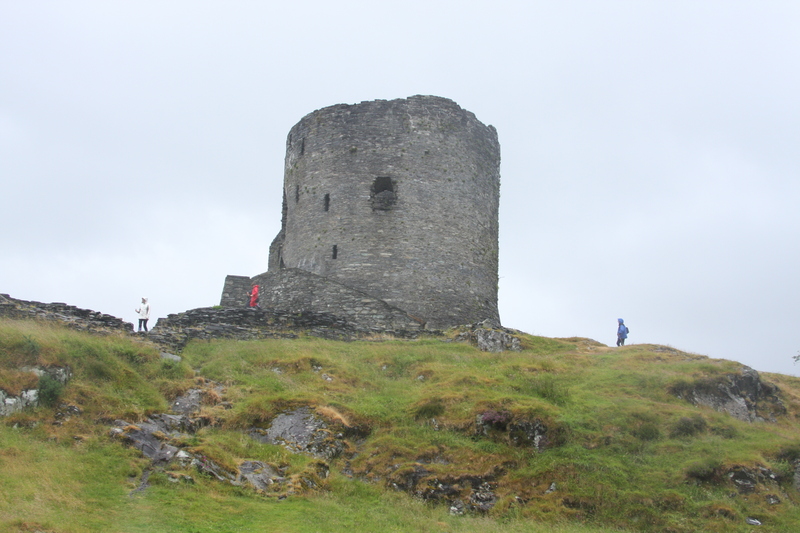 Owain ap Gruffydd was imprisoned in this very tower for 22 years by his brother Llewelyn. 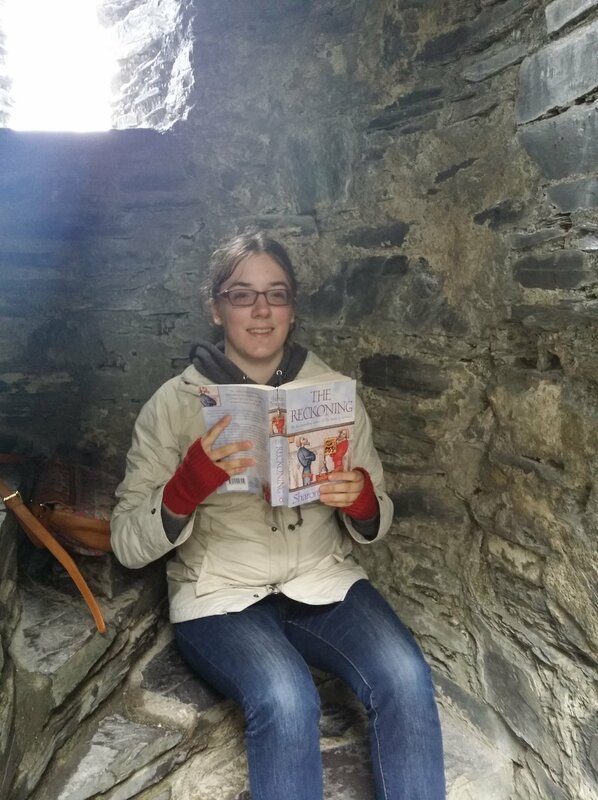 Here is Leah, sitting in the stone spiral staircase leading to the top of the tower, reading from the book the scenes that took place there. 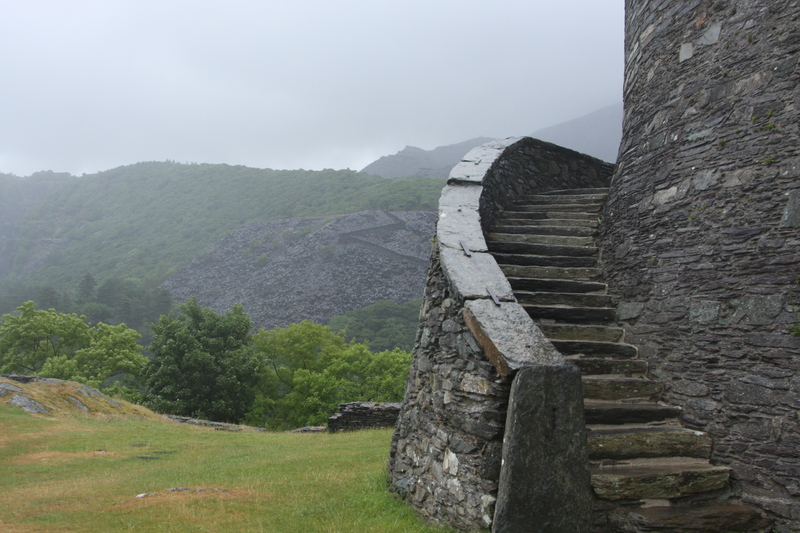 Our experience in Dolbadarn made up for the rest of the day, and driving back to the hotel through the stunning Llanberis Pass was just icing on the cake. The next morning dawned bright and sunny. 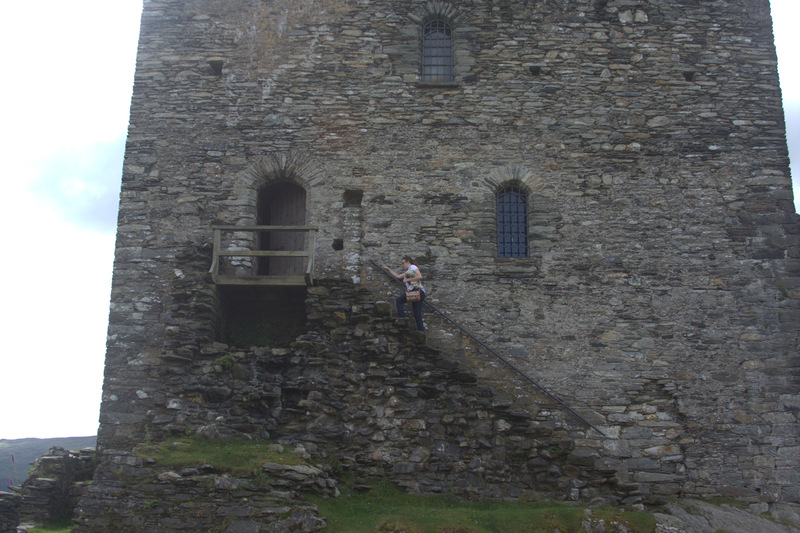 We had stayed in the town of Dolwyddelan because much of the trilogy takes place at Dolwyddelan Castle. We hiked up there just after breakfast. 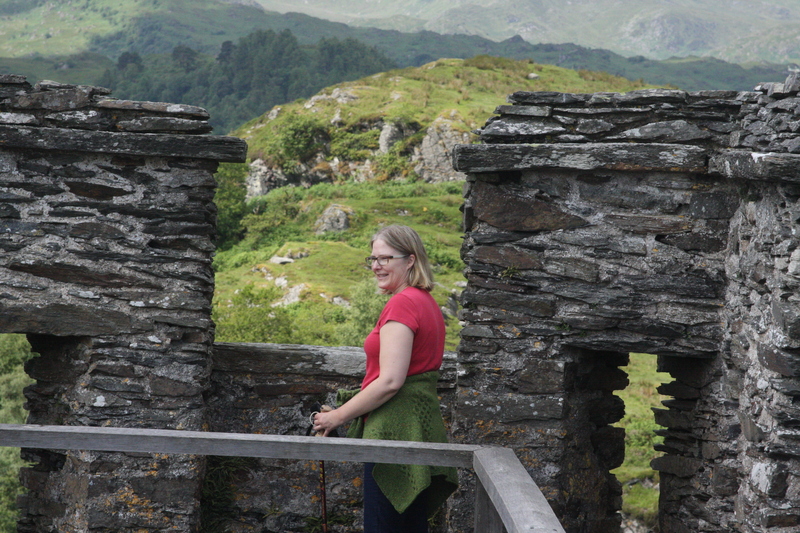 Leah: Well, its too bad that we now have a crowd here, but at least they are speaking Welsh. It adds to the atmosphere. Me: How do you know they are speaking Welsh? Leah: Can’t you hear? The language has voiceless lateral fricatives. There are not too many languages with voiceless lateral fricatives, Mom. I mean, Navajo is one I suppose but it’s highly unlikely a busload of Navajo speaking teenagers is touring around Welsh castles today. This is music to the ears of any linguist parent: a child who says the words “voiceless lateral fricatives” in ordinary conversation, much less recognizes them when she hears them. Oh, the simple joys of parenthood! 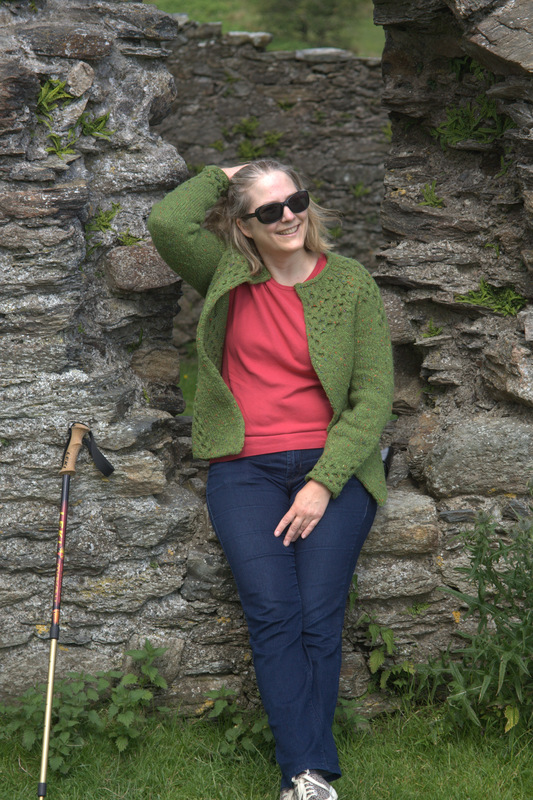 I can’t resist, since this is indeed a knitting blog, the following photo which shows off my Killybegs sweater. 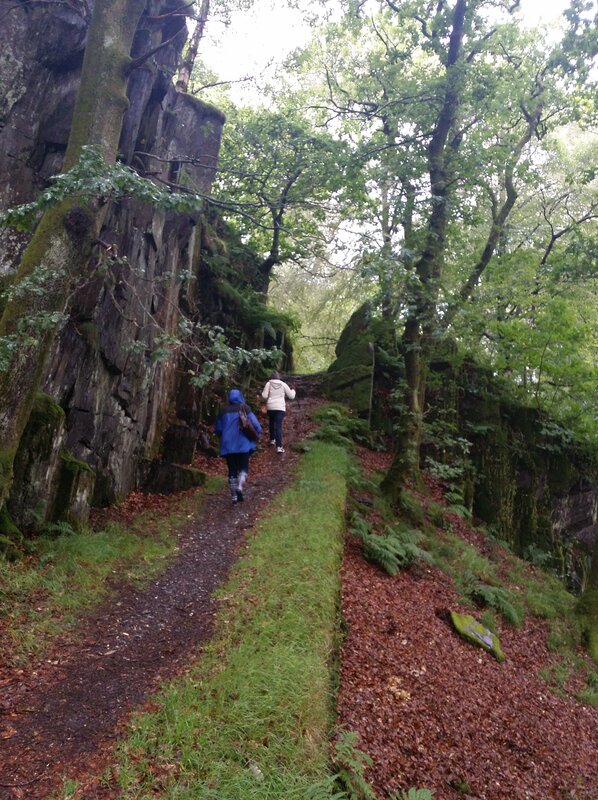 When you are hiking through this kind of weather, with sun and wind and mist and rain, you realize that there truly is nothing that works as well as wool. (I am convinced that all of the sheep in Wales agree with me.) 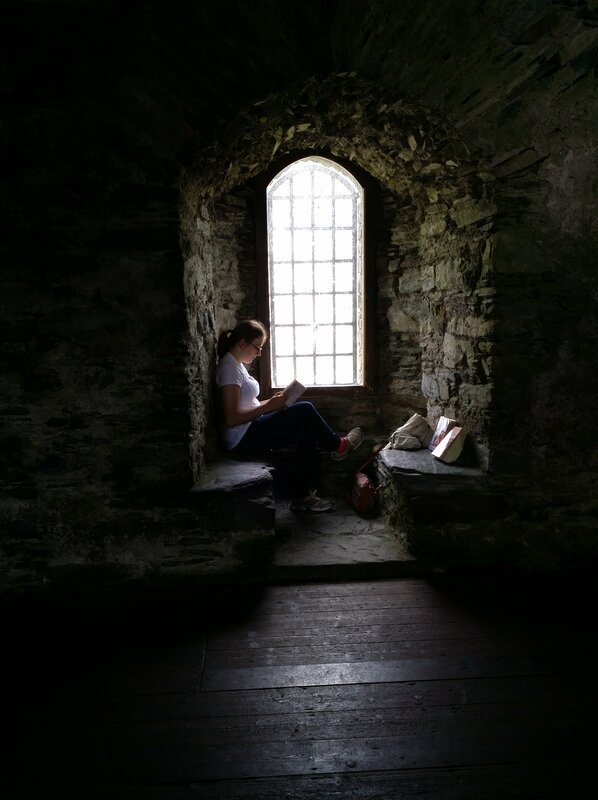 I am also sitting in a 13th century window here, which is pretty amazing. The last stop of the day was totally magical. 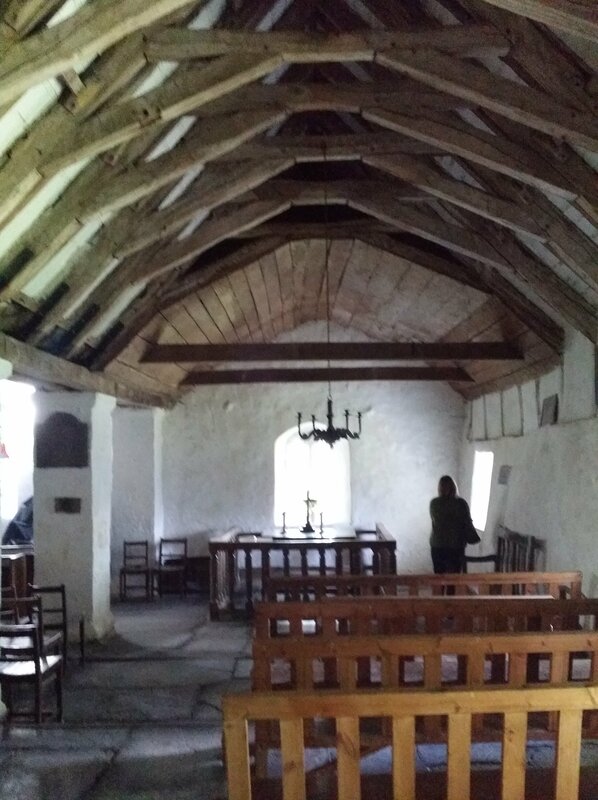 This was the church at Llanrhychwyn. 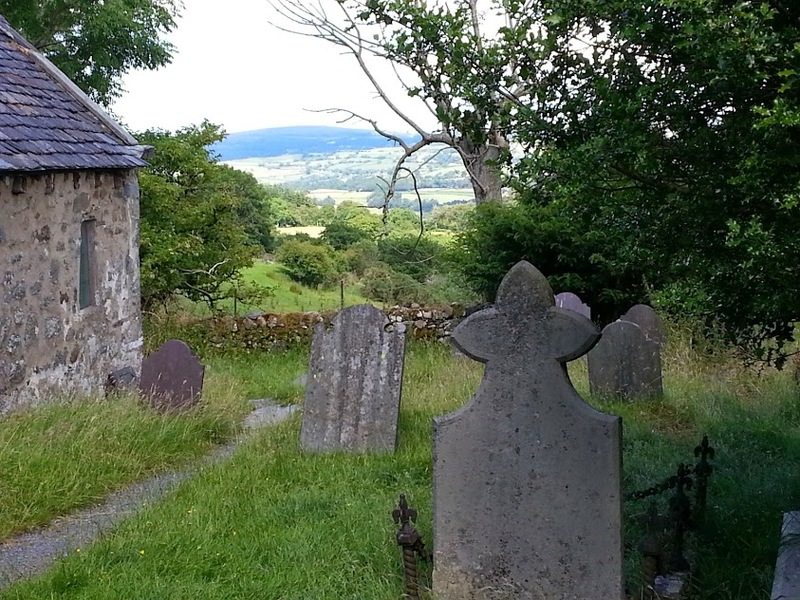 Parts of the church date to the 11th century- it is, in fact, the oldest church in Wales. 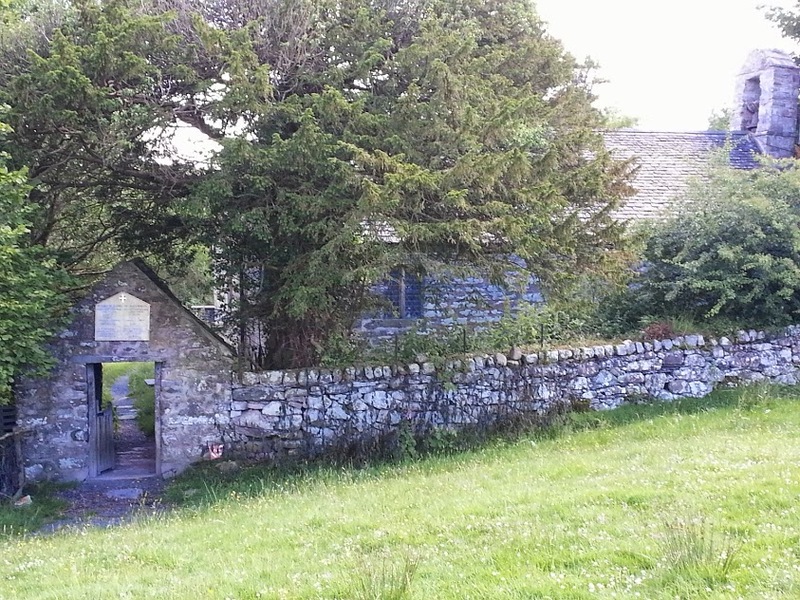 Llewelyn Fawr and his wife, Joanna, worshipped here. Part of the magic was in finding it at all. 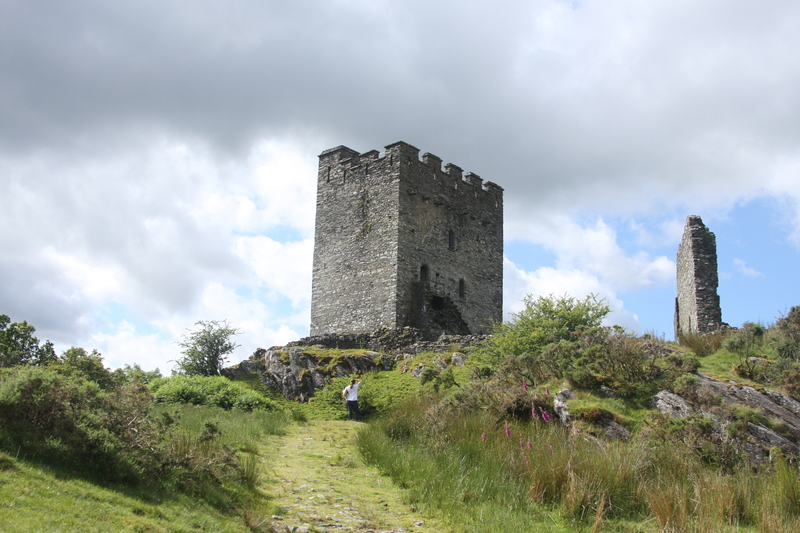 It is up in the hills, and not signposted; it was true serendipity in the guise of two hikers who appeared at just the right moment and directed us through unmarked fields to this amazing treasure. The church sits at the top of a hill with views stretching out over a valley. There is barely any indication of modern life. It is easy to feel transported back through time. The inside is so spare, so simple. I find it astonishingly beautiful. If you have no feel for history whatsoever, you would still feel the magic of this spot. If you are a fan of the books, however, it is very moving. 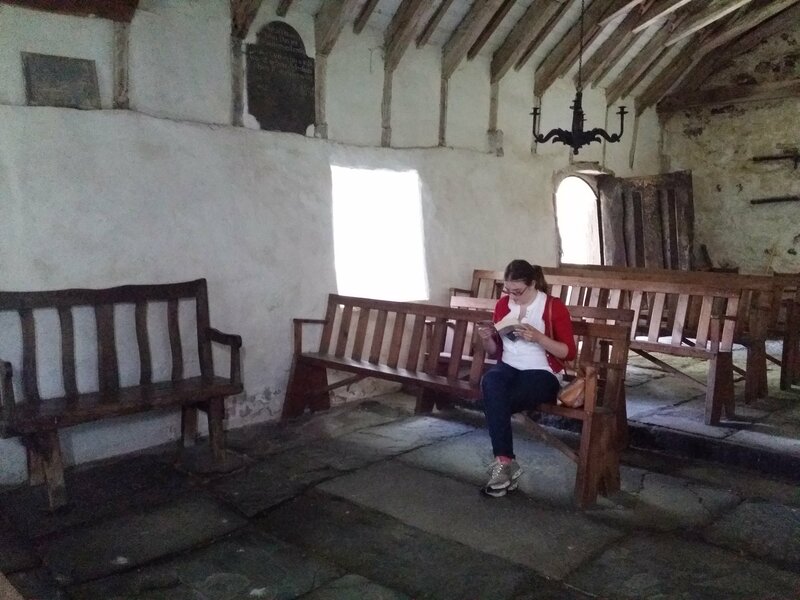 One of the books, Here be Dragons, ends with Joanna worshipping alone in this very church. Leah was able to sit here and read that scene. Lovely, don’t you think? 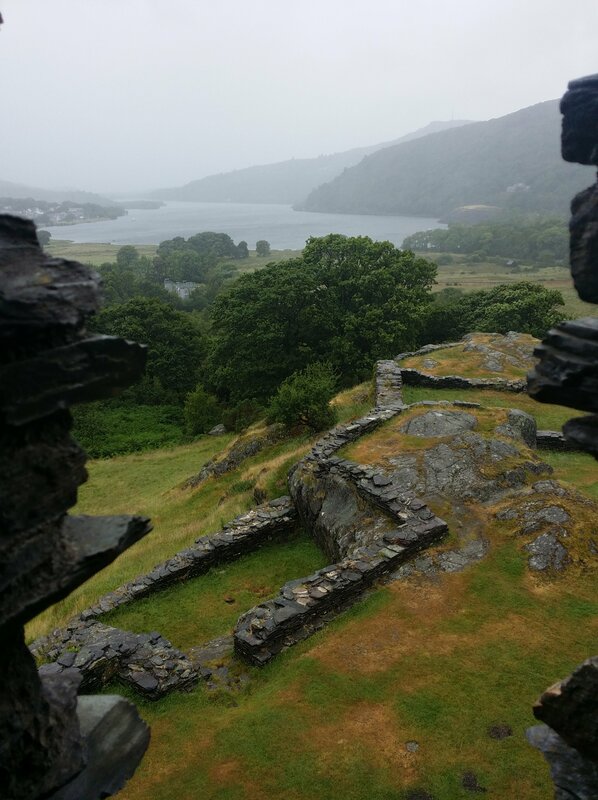 This entry was posted in Main, Travel and tagged Dolbadarn Castle, Dolwyddelen Castle, Knitting, Llanrhychwyn Church, Llewelyn Fawr, Medieval History, Medieval Wales, Sharon Penman, Travel, Wales, Welsh Princes Trilogy by knitigatingcircumstances. Bookmark the permalink. Oh! This whole post is so amazing. I adore castles but as I’m in the US, I’m not sure if I’ll ever have the opportunity to see any. And this post! Perfectly captures what I love about them. I’m so glad you were able to make the trip and share it with us. Thank you! 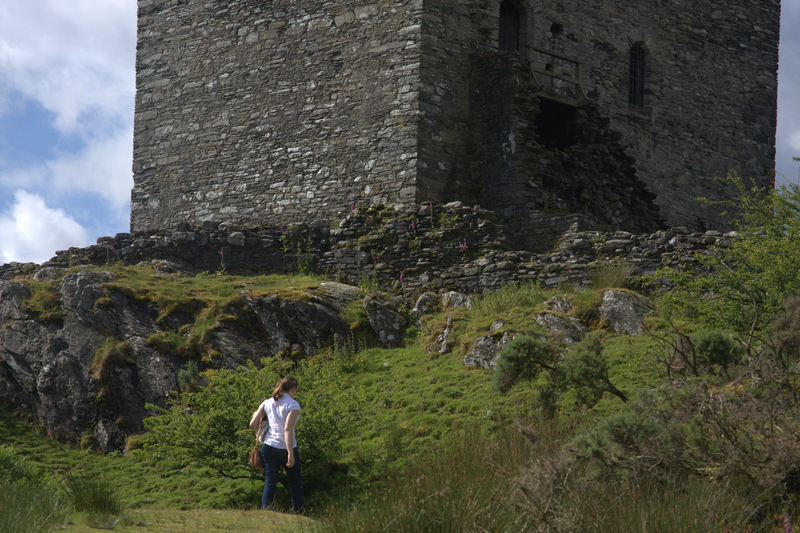 If you like castles, Wales is a great destination. We are lucky to live close enough for a visit. I’m glad you enjoyed the post. wow – what a great few days! Of cours,e the sweater looks perfect, bit also it is wonderful when a person relates so to a set of books and can go appreciate the sites. Thanks. Book tourism is an interesting thing. I have always wanted to go to Prince Edward Island, for example, mostly because of the Ann Shirley books. 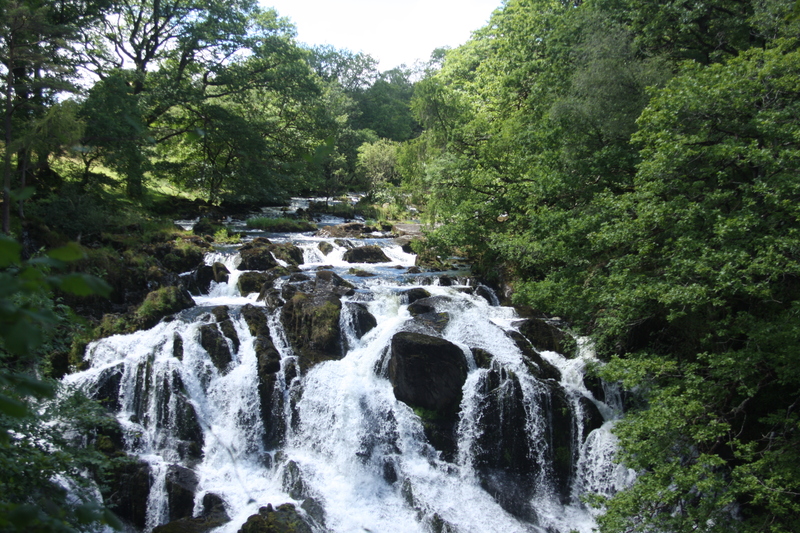 It is especially great when the places and the countryside live up to your expectations. You should go to PEI, but brace yourself for Commercialism (capital C intended). They know they have a treasure in Anne Shirley. 🙂 That does not change the fact that the sites of the book are wonderful and pretty much as they are in the book. It’s just that much of what is around them is not. I don’t recall mini-golf and wax museums in the books. 🙂 But it was so wonderful to actually see the red earth of the dear island. I hope you get there someday. And I hope I get to Wales someday! What an incredibly beautiful place! Your sweater fits so nicely among that gorgeous landscape. Thanks for sharing! You’re welcome. I had a hard time with this post as there were technical difficulties with many of the photos. I am glad that I persevered. I perhaps should have warned people; these are VERY long books. If you get into them, it will take lots of time away from knitting. That was a beautiful post, Kelly! Happy that Leah is at home, and that you’re managing to get out and about. Is Emma coming home this summer or staying in Van? I just got 7 skeins of Kidsilk Haze in a gorgeous purple called Ultra. I’m finally breaking down and making the Lily Chin Cabled-Rib Shawl. Hopefully you can find the time to knit a bit as well! Cheers! Hi Ann! How nice to hear from you. I guess you managed to survive the winter horribilus! You will not regret making that shawl; it is among the greatest things I have ever knit. Funny, I’ve often thought about making another in purple! Unfortunately, Emma is in Canada this summer, taking classes and working.